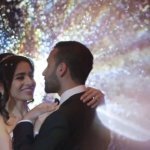 One of the most energetic, upbeat, and to put it simply, “happiest” weddings we’ve filmed happened just this last summer for us here at SDE Weddings, Toronto’s premier wedding videography, cinematography and photobooth group. Oluwadara & Adeniyi (Dara & Ade, for short), a young Nigerian-Canadian couple, held their wondrous wedding ceremony and celebration in an unforgettable two-day event on June 12th and June 14th. The first day of filming for our videographers and cinematographers was a traditional Nigerian wedding held in complete cultural-flair at Toronto’s Jamaican-Canadian-Association’s Community Centre, while the second day was a wonderful and beautifully-arranged Christian wedding which took place at Toronto’s Revivaltime Tabernacle, with an evening’s reception held at Woodbridge’s Madison Event Centre, just north-west of Toronto. Not at all new to multiple-day wedding ceremonies and celebrations, our videographers and cinematographers had an excellent time filming many memorable moments throughout the two days of working with Dara & Ade and their family and friends. Laughter and joy, song and dance, and every emotion and experience in between were neatly wrapped and beautifully presented throughout the Dara & Ade’s two-day wedding, and keeping true to our name, our videographers and cinematographers had provided a specially crafted ‘Same-Day-Edit’ highlight video which was showcased during the newlywed couples’ premier reception hours, a true honour for us indeed. Scroll further to learn more about our videographers’ and cinematographers’ favourite shots throughout and a sample of our work in a featured highlight reel of Dara & Ade’s unforgettable wedding experience. It truly was a ‘dream come true’ for Dara & Ade, whose traditional Nigerian wedding ceremony took place last summer on June 12h, 2014, and a truly remarkable experience for our videographers and cinematographers in immersing ourselves in Nigerian culture through the most sacred of life’s events in a wedding. The first sight that stands out was the many varied and colourful wardrobes and garbs worn by the celebrants, bridesmaids and groomsmen and indeed the couple themselves. In Nigerian culture, the large and extravagant headwear worn by the women is called a “gele” while the men’s hat is a “fila”. The equally colourful robes are called a ‘sokoto’ for the men, and an ‘iro’ for the women. In the highlight reel featured, you can see that Dara & Ade’s bridesmaids chose a matching orange to complement an overall orange theme of the traditional wedding, while many of the celebrants, Dara & Ade especially, wore their wedding dresses in shimmering gold. Plenty of wonderful scenes were captured by our videographers and cinematographers for the first day of filming. Among our favorites was the penultimate scene of Ade knelt down to place the ring onto Dara’s finger, a beautiful once-in-a-lifetime moment which was met with jubilant celebration from the crowd, and featured in the highlight reel. A true tear-jerker, you can’t help but feel happy for the two. For the second-day of the wedding, June 14th, 2014, Dara & Ade chose Toronto’s Revivaltime Tabernacle for their ceremony and held an unforgettable wedding reception at Woodbridge’s Madison Event Centre. 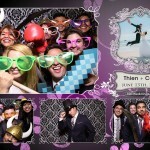 Suffice to say, that Saturday evening was filled with more than enough song, dance and celebration to last a lifetime. For our videographers and cinematographers, the venue was all-in-all beautifully arranged, with a grand deep violet theme which the wedding celebrants had also matched in their choice of elegant wardrobes. Dara & Ade’s energy was altogether contagious, as they celebrated their wedding sacrament through a dance down the aisle, and welcomed the evening’s celebration with the same dancing rhythm as they proceeded into the Madison Event Centre’s ballroom hall. A favourite scene of our videographers and cinematographers was Dara & Ade’s memorable first dance together. The newlyweds, truly in love, held each other tightly underneath a full spotlight, with friends and family looking on and sharing in the couples’ happiness. A true feel-good moment, to say the least. For the reception, our videographers and cinematographers had crafted a specially-made Same-Day-Edit of the scenes we had filmed earlier during the day alongside footage from Dara & Ade’s earlier traditional wedding; a personal gift from us to the happily newlywed couple on their special day. A toast to Dara & Ade is also featured in the highlight reel, with a beautiful line to simplify Dara & Ade’s wedding, as “one day out of so many wonderful days to come in your life”. In the end, we here at SDE Weddings, Toronto’s premier wedding videography, cinematography and photobooth group, echo these beautifully phrased words for Dara & Ade. We wish the two the very best in their lives together, and hope that our work in capturing their most precious moments will stay with them throughout their many days ahead.